On the way, we picked up another family who was from France and also part of the class. There were five of them, so Mary and her husband, joined us in our tuk-tuk. Mary is a chef and on a three-month trip around Asia with her husband, after spending a year in New Zealand. His parents and a friend are visiting them while they are here in Cambodia, got their own separate tuk-tuk. 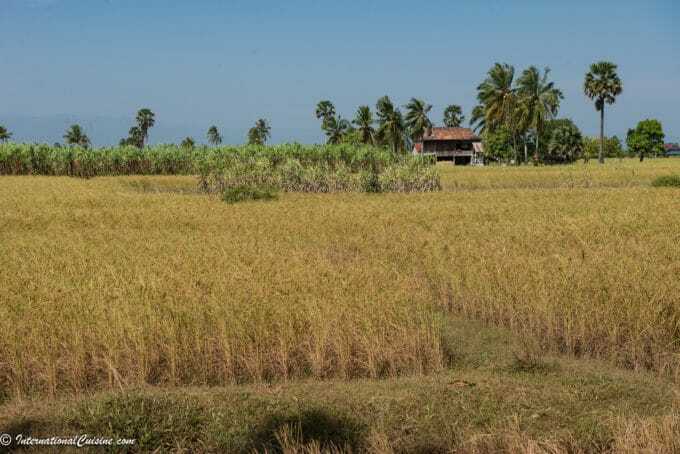 We traveled along red, dirt roads, filled with rice fields, passing small villages along the way. This was the country side that I had dreamt of seeing in Cambodia. The rice fields were golden and ready for harvest. Children were playing along the fields and greeted us with huge smiles and a hello as we passed by. This is the simple life. People doing what they need to do to get by, to put food on the table and to care for their family. 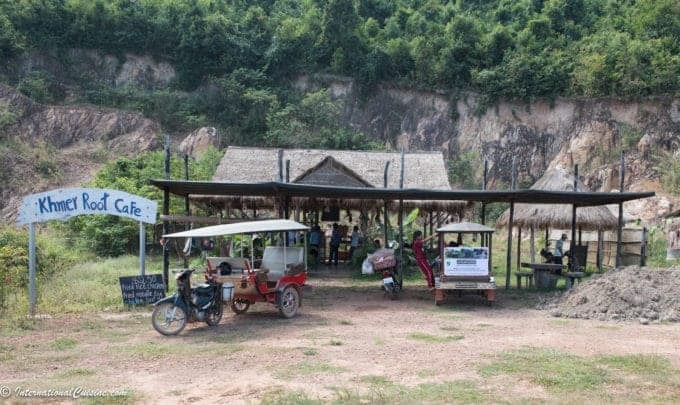 We arrived at the rural, open air, stick built, restaurant called the Khmer Root Café. It had a thatched roof made of coconut tree fronds. 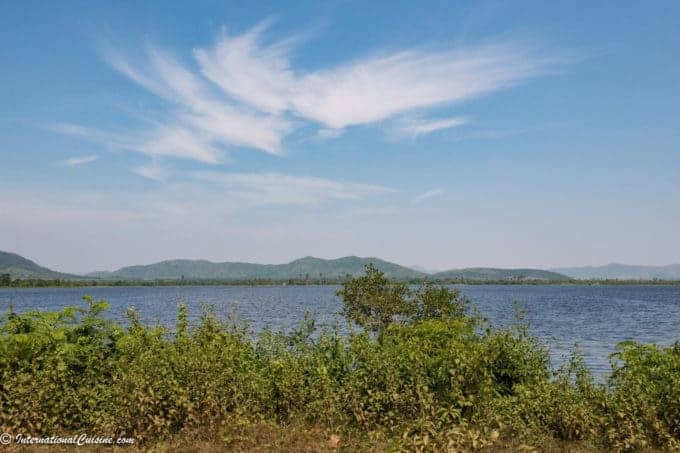 The view from the restaurant was, a large, idyllic man-made lake, built by the people for the Khmer rouge, so they would have fresh water for growing rice. It is called the Secret Lake. The setting for this Khmer class met every expectation of total authenticity. 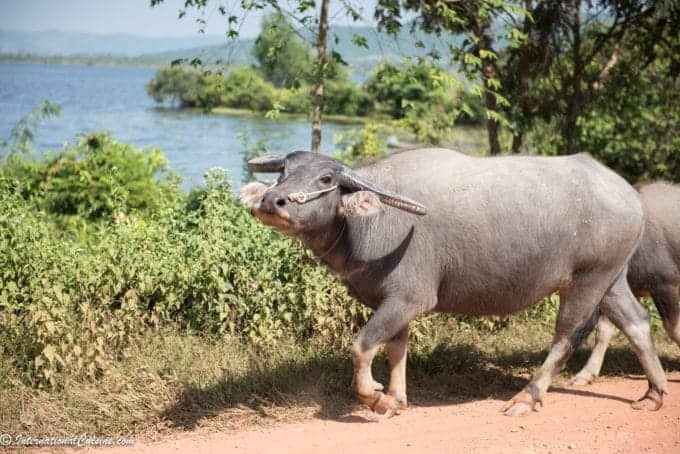 Locals walked by casually, with one lady leading a few water buffaloes that evidently did not like getting their picture taken. I thought this one was going to charge at Dan while he was getting the photo. Do you see that look in its eye? At the café, it was a family affair. The chef, Soklim, was a soft-spoken man who was fluent in English. His mother, wife and daughters all helped with the preparation of the ingredients and gathering the necessary implements. All the ingredients are home grown from their own garden, the meat is from their animals and the fish comes from the lake. It brings a whole new meaning to farm to table. 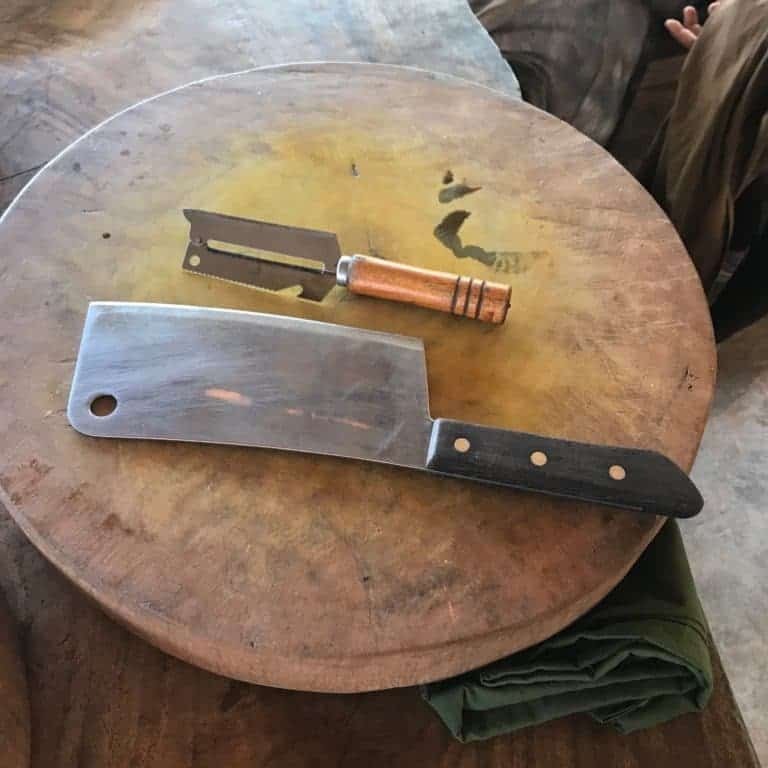 There were large wooden rounds that were used as the cutting boards, and each had a knife and grater placed upon them. It was an idyllic setting for a cooking class. 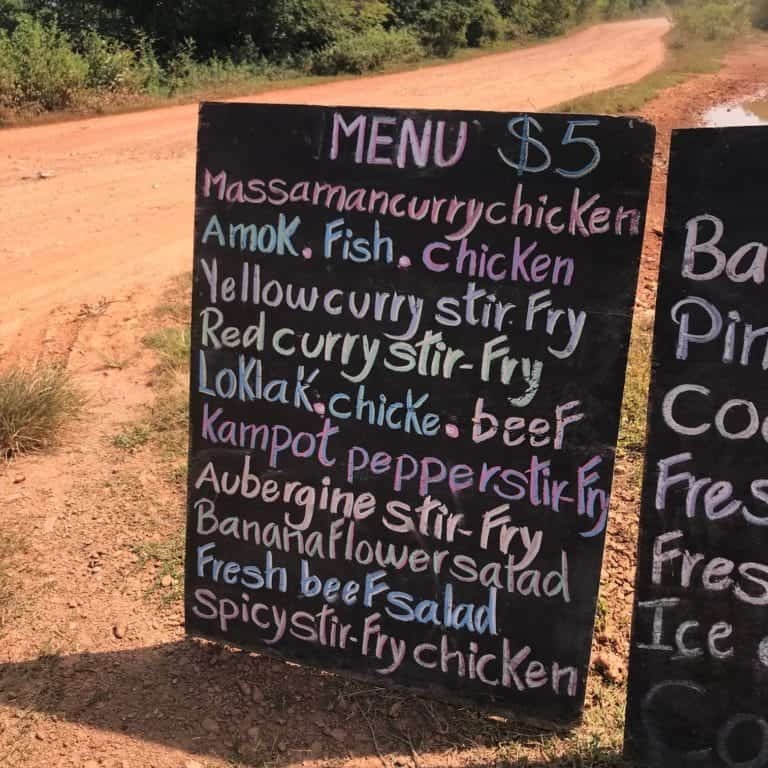 We were each able to choose two dishes to make from the menu, everything was an option, except for the Banana Blossom Salad, which wasn’t currently available. Since there were seven of us cooking, we were able to see everything on the menu being made. 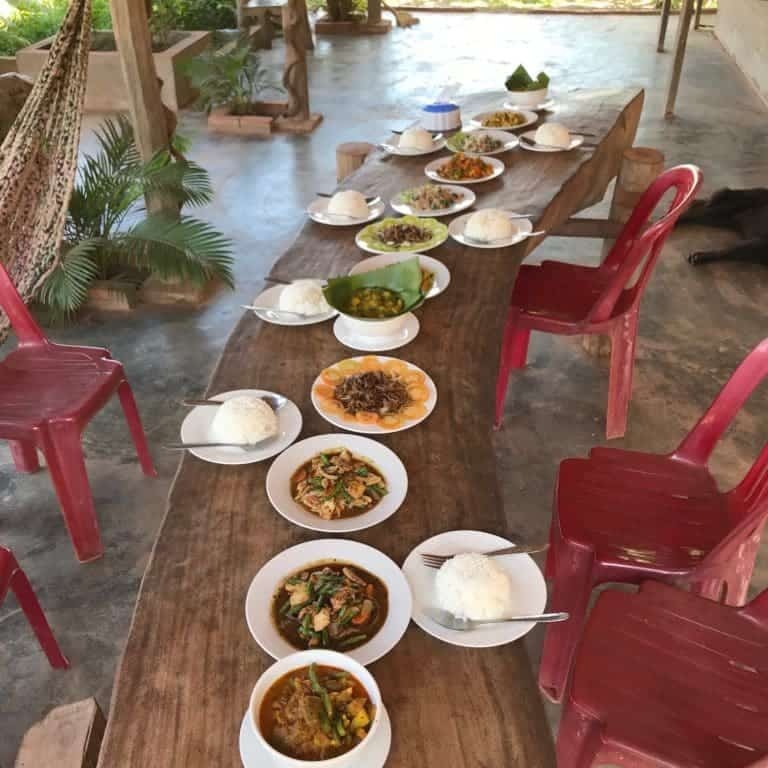 The result was an amazing display of wonderful Khmer cuisine. The chef would take all the necessary time with each participant, to show us how to prepare and cook our dishes. The chef’s young daughters were happy every time we ordered a beer because Angkor (the most popular beer in Cambodia) is running a promotion, that if the pull-top has a certain symbol on it, you win a free beer. The girls were very keen to this and had a blast checking to see if they had found the special symbol. This game brought them great joy. When it became clear that we had made way more food than necessary for the seven of us to eat, we shared with the entire family, for which they were most grateful. We had a lovely meal conversing with the family and our new found, cooking friends. Mary’s husband’s parents were so adorable and have a vacation home in Senegal, which they invited us to visit. We certainly hope to one day. We had a blast with all of them and truly hope our paths will cross again. We said our heartfelt goodbyes to the chef and his family and left knowing we now have a memory and recipes that will last a lifetime. 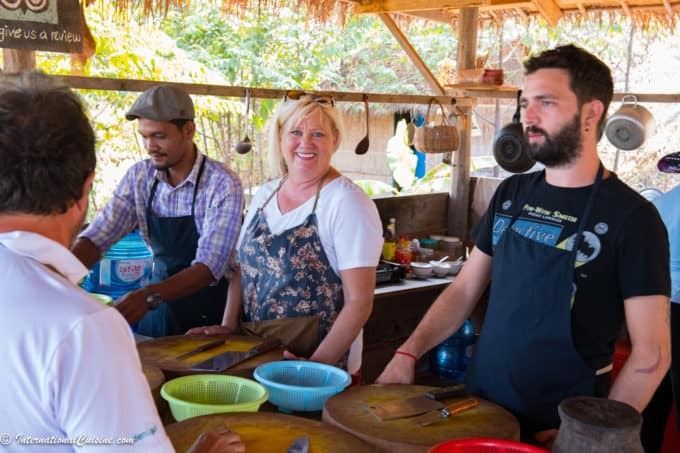 A cooking class is one of my absolute favorite ways to get to know a country, its cuisine and especially the people. This was no exception. After the cooking class, we stopped for a tour of La Plantation; a place where they grow the famous Kampot pepper. We learned all about the different processes used on the organic farm and also had a pepper tasting. Honestly, this pepper deserves all the rave reviews about it being the best pepper in the world. 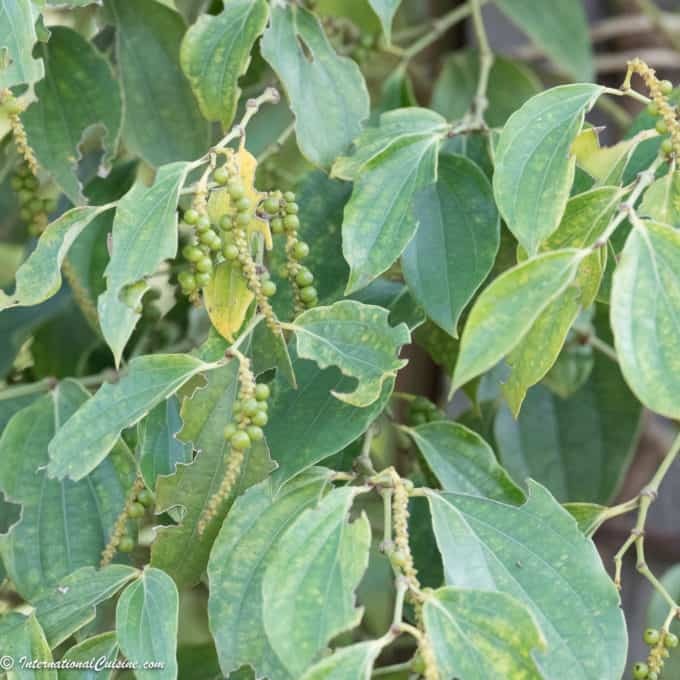 In fact, I fell in love with it so much, the owner of La Plantation invited us to become a distributor for the pepper on the west coast of the USA. So perhaps we can look forward to the opportunity to distribute this amazing pepper in the coming months. 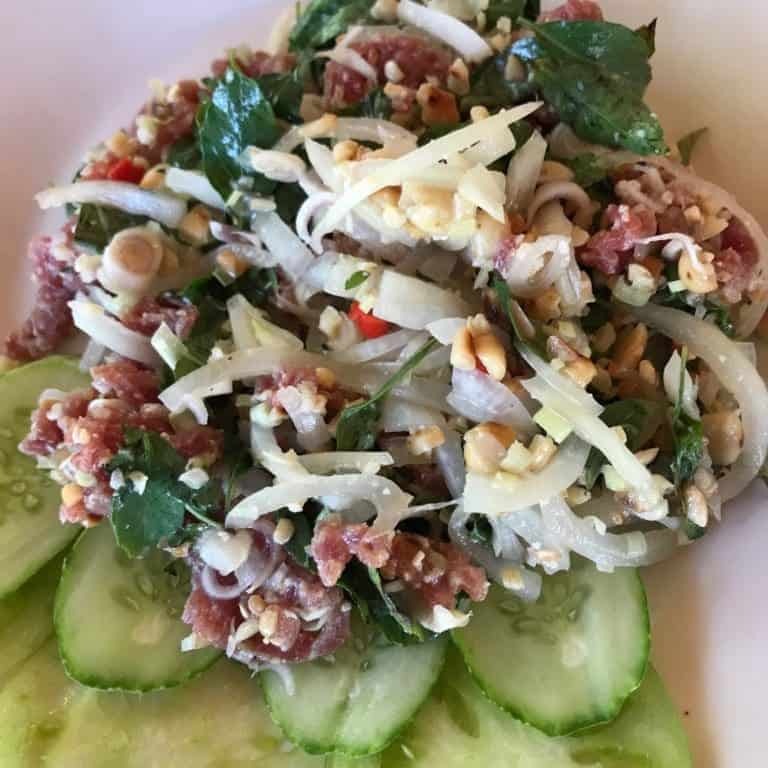 I leave you with the delicious Beef Salad recipe that was a favorite at the cooking class. It is really quick and easy to make and absolutely delightful. Simply click on the link or picture for the recipe. I hope you are following our journey on Instagram @Internationalcuisine where I am posting daily stories and pictures.